“How can you side with bigots and racists?” “How can you support the vile BNP agenda?” “You’re a Christian, for God’s sake, and here you are sowing division and hate, you stupid little man.” “Just f*** off and die.” “Here’s what you’ve done, you t**t” (accompanied by a picture of graffiti on a Polish community centre). “..not all Brexiters are racists and xenophobes, but all racists and xenophobes are Brexiters.” This is just a sample of recent missives received by social media and email. Apparently, the result of the EU Referendum vote means “it’s become OK to be racist in Britain“. The left-liberal media are piling on the irrefutable causality. It seems that when racists agree with a political policy, the policy becomes unbearably toxic and must be dropped. If it can’t be dropped, Christians have a moral duty to reject it for the common good. The proposition is so politically naive and absurd it hardly merits refutation. The BNP advocates “a massive building programme for low-rent social housing that would both create jobs and new homes”. Labour had better jettison their identical proposal PDQ: they can’t possibly share common ground with bigots and racists. There are undoubtedly some vile people out there who are abusing Asians, Muslims, Poles and Romanians, but it seems particularly crass for Remainers (including some senior clergy) to smear all Brexiters with the whiff of racism (not to mention stupidity). Controlling the nation’s borders was never about race, but numbers. Isn’t it actually less racist to advocate a points-based immigration system which gives brown-skinned and black-skinned people from the Commonwealth the same hopes of living and working in the UK as majority white Europeans currently enjoy? Isn’t it racially equitable to consider the immigration merits of the Indian doctor as well as the Polish plumber? In the midst of all this reported discord and division (which, let’s be honest, has always been present in society but the left-wing media get tired of reporting it until they’ve got a new ideological right-wing ‘hate’ hook on which to hang it), Justin Welby was busy loving his neighbour by hosting the inaugural Lambeth Palace Iftar – the fast-breaking meal during Ramadan – with London’s first Muslim Mayor Sadiq Khan and Chief Rabbi Ephraim Mirvis. 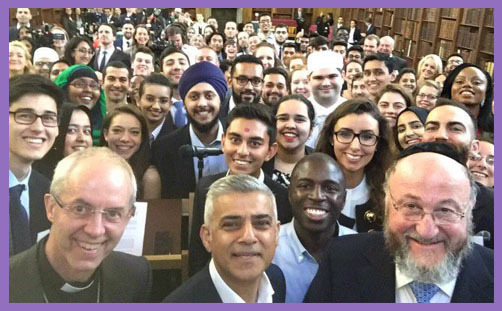 They were joined by a host of people, young and old, representing all faiths and cultures. “At a time of uncertainty and division, it’s a joy and privilege to celebrate this great world city with young people from different backgrounds and religious traditions,” the Archbishop said. The picture accompanying this post won’t feature in any of the mainstream media today: it doesn’t quite fit with the post-Brexit narrative. Just as all Christians ought to reflect the integrity of the Trinity, Justin Welby’s substance and essence are in unity: he says what he means and lives what he says. A few politicians might learn from his substantial conviction and essential authenticity. God embraces unity in diversity: He is transcendent and immanent; dynamic and unchanging. In a world of constant change, nuanced diversity and ever-extending multiplicity, only by loving our neighbour can we begin to heal the splits, join the fragments and mend the tears in the fabric of society. We have a responsibility, as the Church of Jesus Christ, to respect difference and fellowship with the faithful and unfaithful. We are exhorted even to love our enemies, which must extend to our political opponents. So, instead of denouncing those who voted to leave the EU as fatuous, dense and doltish, perhaps a few Brexitophobic Remainophile clergy might reach out as Jesus did to prostitutes and tax collectors. Unity in the Spirit transcends all petty politicking: the wisdom of God shows the wisdom of man to be folly. If you seek to represent and incarnate the ultimate unity of God in a world of hate and division, it really doesn’t help when you berate and patronise your neighbour for his political beliefs. No man is perfect in knowledge: our tweets reflect the fragmentary sequential thinking of our finite intelligences. Respect and tolerance are due to all. Perhaps Lambeth Palace needs to host the inaugural Brexiter-Remainer supper, and gather up rebellious priests with the primordial politicians over a glass or two of Shiraz, to talk all night of trust, cooperation, participation, responsibility, possibility, and the freedom there is in Christ of just letting be.